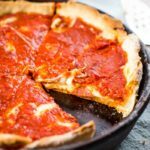 Delicious homemade deep dish pizza recipe with a buttery thick crust and layers of mozzarella, sauce and you favorite toppings. This recipe makes two 10 inch deep dish pizzas. In a small bowl combine water, yeast and sugar. Set aside. In a large bowl, combine flour, cornmeal and salt. Stir. Add the yeast, melted butter and olive oil. Combine to form pizza dough. Drizzle dough with olive oil to coat. Cover and let dough rise for one hour. Once dough has doubled in size, divide into two dough balls. Roll each half until 12 inches in diameter. Add to cast iron or deep dish pan. Top with mozarella, then your favorite toppings and finish with pizza sauce. Bake for 25 minutes or until edges and bottom are golden brown. Let cool for 5 minutes and slice to enjoy! Nutrition information is based on a deep dish pizza with green peppers and onion as toppings. Additional toppings will alter the nutrition information.